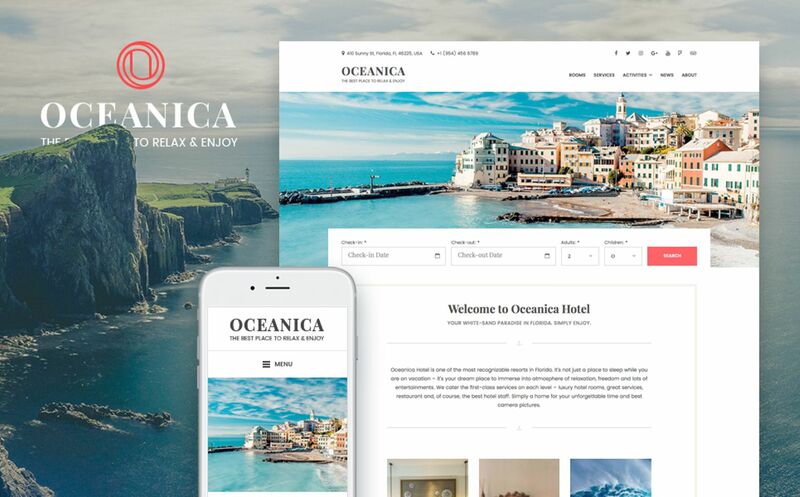 Oceanica is a powerful WordPress hotel theme that comes with a perfect responsive design and a room booking system. It was crafted to present your hotel, apartments, villa, vacation rental or other types of a rental property and provide your guests with a seamless online reservation process. The theme is fully responsive, SEO-optimized and perfectly works with a native WordPress functionality (that means, the theme design is not locked down with functionality). The theme is powered by a user-friendly Hotel Booking plugin (the plugin is included for free!) that will help you create a stunning gallery of your accommodations, turn on online reservation service and manage your bookings without tech help. The toolkit to set up and control your reservations is very flexible: you can add rates, seasonal prices, block rooms, accept online and offline payments, sell extra packages and more. 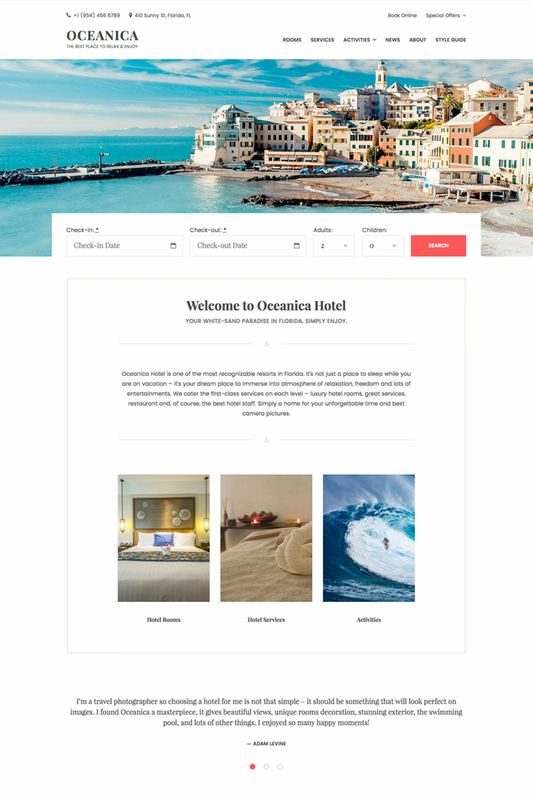 Oceanica is extremely elegant and lightweight WordPress hotel theme. It's not overpacked with wrong plugins: everything is built around your hotel rooms, services and reservation. You'll use a handy WordPress Customizer for brand identity customization, color scheme changes and more. Create an awesome rooms listing and enable online reservation for them with a built-in WordPress booking plugin, which is professionally translated into multiple languages. The search availability form is very easy to use for guests and always shows the correct number of available rooms (it processes bookings data automatically). Accept online reservation payments through PayPal, 2Checkout, Stripe, Braintree etc. or let guests pay after arrival. You can also use WooCommerce payments addon for more gateways. Set different prices for low and high seasons, weekends, or whatever period you want. Set different rates for rooms - refundable, non-refundable, breakfast included, etc. Price the rooms accordingly depending on their benefits. Mark any dates for certain rooms as unavailable (not check-in, not check-out, not stay-in) and guests won't be able to book the accommodation during this period. Add mandatory taxes and fees to your accommodations and services. Keep your pricing info complete and correct. Sell or offer for free extra bookable hotel services and packages - the guests can pre-order them when placing a booking request. Set the system to confirm bookings automatically after the payment or control each booking manually. It's very easy for your hotel staff to manage all bookings - view booking and customer details, edit them, check a payment history, view all booking statuses in a handy calendar format, etc. All in one WordPress dashboard. Transform booking email notifications into your brand emails. Automate the process of sending them. Synchronize all reservations submitted directly on your site with those on OTAs like Booking.com or Airbnb with a help of iCalendar. The process is automatic. Create and customize discount coupons for your loyal clients. Coupons can be applied on the checkout page. * Added theme support for WordPress 5.0 (Gutenberg). * Hotel Booking plugin updated to version 3.0.3. * Introducing attributes. By using the attributes you are able to define extra accommodation data such as location and type and use these attributes in the search availability form as advanced search filters. * Improved the way to display the booking rules in the availability calendar. * Added the new payment method to pay on arrival. * Added the ability to create fixed amount coupon codes. * Added the availability to send multiple emails to notify the administrator and other staff about new booking. * Fixed the bug appeared in the Braintree payment method if a few plugins for making payment are set up. * Added the ability to set the default country on the checkout page. * A new way to display available/unavailable dates in a calendar using a diagonal line (half-booked day). This will properly show your guests that they are able to use the same date as check in/out one. * Disabled predefined parameters for Adults and Children on the checkout page to let guests have more perceived control over options they choose. * Fixed the issue with booking rules and WPML. Now all translations of accommodations are not displayed in a list and the booking rules are applied to all translations. * Fixed the issue with Stripe when creating a booking from the backend. * Fixed the issue with the booking rules not applying while checking an accommodation availability with the "Skip search results" enabled. * Hide "adults" and "children" fields within search availability forms. * Disable "children" option for the website (hide "children" field and use Guests label instead). * Disable "adults" and "children" options. * Replaced "Per adult" label with a more catch-all term "per guest" for Services. * Increased the number of digits after comma for setting a per-night price. This will help you set accurate prices for weekly, monthly and custom rates. * Improved the way to display a rate pricing on the checkout page: the price is updated automatically based on the number of guests if there are any per-guest price variables. * Added all missing currencies to the list of currencies. * Added the ability to change a default anchor icon separator (editable in WordPress Customizer). * Added a post without sidebar page template. * Added the ability to import demo data (sample content) in one click. * Hotel Booking plugin updated to version 2.7.4. * Added the ability to add monthly, weekly and custom (based on any length of stay) rates. * Added a new admin data picker style. * Single room type data output was rewritten in actions to provide developers with more flexible customization. * Fixed the bug with the months localization of the admin booking calendar. * Fixed the alphabetic ordering of countries for non-English websites. * Added Summary and Description info to iCal import logs to help you easier identify bookings from different channels. * Added the ability to create a reservation manually. * Added terms and conditions checkbox to booking confirmation page. * Added the ability to set different prices for one accommodation based on a number of guests. * Added a new option to skip search results page and enable direct booking from accommodation pages. * Fixed the bug with check-in and check-out time not saving. Time settings were set to 24-hour clock system. * Added the following mphb_rooms shortcode parameters: category, tags, IDs and relation. Now you can display accommodations by categories, tags or accommodation IDs. * Added a new field to settings where you can set a standard child's age accepted in your hotel establishment. This is an optional text, which will complete "Children" field label clarifying this info for your visitors. * Improved the search availability calendar. Now it correctly displays the minimum stay-in days depending on a check-in date. * Fixed the bug with all dates displaying as unavailable within certain booking rules. * Fixed the bug with a custom rule not being applied because of a global booking rule. * Fixed the bug with the Availability calendar not showing the correct number of available accommodations. * Added "Blocked accommodation" status to the Booking Calendar. * Added a new DESCRIPTION field with the booking info to the Export Calendar in iCal format. * The Export Calendar in iCal format now shows the SUMMARY in the following format: first name, last name and booking_id. * Now the booking information from external calendars is sent across booking channels without changes. * Hotel Booking plugin updated to version 2.4.1. Added the ability to apply taxes and fees. * Made the theme WooCommerce ready. * Hotel Booking plugin updated to version 2.3.1. * Hotel Booking plugin updated to version 2.3.0. Added more flexible booking rules. * Added support for Jetpack Content Options. * Hotel Booking plugin updated to version 2.2.0. Implemented bookings synchronization with online channels via iCal interface. * Hotel Booking plugin updated to version 2.1.2. * Hotel Booking plugin updated to version 2.1.1. * Hotel Booking plugin updated to version 2.1.0. Added the ability to add multiple bookings into one reservation and discount coupons support. * Added Shortcode Widget plugin that allows to use shortcodes in widgets. If you use Testimonials shortcode in a Text widget, please re-create it and use Shortcode Widget instead of Text widget. * Improved the layout of comments on mobile devices. * Hotel Booking plugin updated. Excellent template! I can customize my site very well. System for booking working good. Thre are a lot of options (seasons, addinional services, amenities and etc) to tuning booking for you hotel. I whant to day a few words about support. I had several questions during website development. Support helped me to install and configure my project. All their answers were very quick and detailed! Thank you!